Moving the Women's Tournament a week later can provide better TV windows and fewer conflicts with the Men's Tournament. Ask any American sports fan for their favorite sports day of the year and many will tell you it is the opening day of the NCAA Men’s Basketball Tournament. Why wouldn’t they? Millions of people fill out brackets and the games are nonstop excitement. With 16 games going on during the first day, fans get nonstop action from noon until midnight. And with the staggered schedule, game are either in crunch time or finishing for eight out of the next ten hours. Comebacks, buzzer beaters, announcers going crazy (we all still miss Gus Johnson), all of it makes for an incredible sporting experience. Then, one day later, the NCAA Women’s Basketball Tournament starts. Other than the First Four, this tournament has the same format as the men, with 16 games on each of the first two days. And yet, for a lot of reasons, the Women’s Tournament draws so much less attention and interest than the Men’s. Part of this is to be expected. Women’s basketball, after all, is less popular on the whole than men’s basketball. And yes, I don’t expect the same bracket frenzy to appear around the women’s game that exists around the men’s. ESPN hasn’t said how many entries their Women’s Tournament Challenge received, but there’s no way it’s anywhere near 17 million for the Men’s Tournament Challenge. 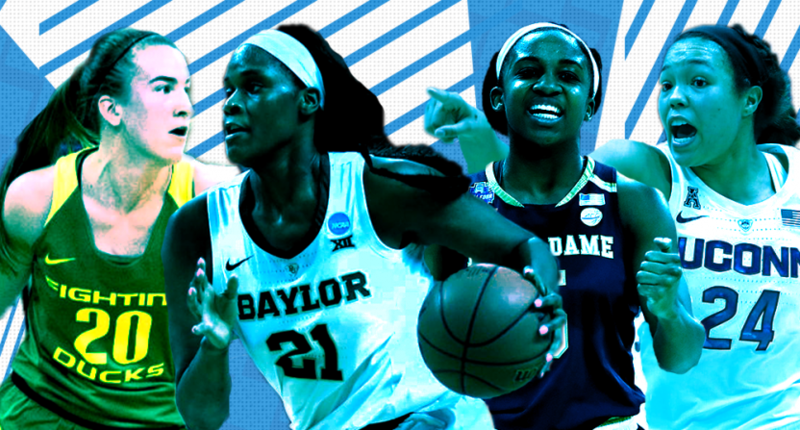 While it appears the Women’s Tournament is less popular, the NCAA and its television partners haven’t given the Women’s Tournament a real chance to compete with the Men’s. The Women’s Tournament isn’t hidden; about 12 of the First Round games are broadcast on ESPN2, while the rest were available via ESPN3/WatchESPN. Of course, that is a far cry from the Men’s Tournament, where every game is broadcast live on a network. Two other major scheduling issues explain why only about 12 games were televised nationally (though ESPN2 can/does switch between contemporaneous games when the situation warrants it). First, the First Round of the Women’s Tournament is competing against the Men’s Tournament. The Women’s Tournament has the same all day excitement of its first two days that the men have, but fewer people are watching because the majority of college basketball fans are watching the men play instead. Second, there is only one channel dedicated to the women’s tournament. ESPN and/or ESPNU are taken for the NCAA Wrestling Championships on Friday and Saturday. Other networks have priority programming. ESPNNews didn’t show women’s basketball, for some reason. So that leaves ESPN2 to show all the games, including games taking place at the same time. Yes, fans could watch any game on a computer or mobile device via WatchESPN or the ESPN App. But that’s still a far cry from how so many people watch the Men’s Tournament. The NCAA has to do two things that will greatly increase the popularity of the Women’s Basketball Tournament. The first, and obvious, solution is to move the tournament a week later. Yes, this means not holding the Final Four and National Championship Game one day before those respective events in the Men’s Tournament. So what? The gains will far outweigh the losses. First of all, there wouldn’t be as many conflicts with the Men’s Tournament. By the Friday of the second week, the men are up to the Sweet Sixteen and starting play at around 7 PM. Sure, there would be some overlap, but the large bulk (12 of the 16, probably) of the day’s games can be completed before the men start play that evening. Now, one week after fans have the amazing experience of a full day of nonstop compelling college basketball, they can do the exact same thing a week later for the women. It would make the opening rounds of March Madness a back-to-back weekly event. This would extend those first two glorious days of the tournament to a second week, giving fans another taste of what they had just loved so much one week before. Additionally, moving the tournament back a week would resolve some conflicts with ESPN. There is no reason that ESPNU can’t broadcast games nonstop during the tournament, just like ESPN2 does. Once you move away from the conflict with the NCAA Wrestling Championships, ESPNU should be available, as should ESPN for a few of the higher-profile games. Between ESPN2 and ESPNU–and putting select games on ESPN (and maybe even relevant ones on the SEC Network)–ESPN should be able to utilize ESPNNews for whichever games are left. That way, every single game of the NCAA Women’s Basketball Tournament can be broadcast in its entirety, as it should be. Starting Sunday, with the second round, ESPN2 and ESPNU can handle broadcasting every game on their own. That’s it. A simple solution. Moving the Women’s Basketball Tournament one week later would be a very easy fix to a problem that shouldn’t exist. The Women’s Tournament is just as compelling as the Men’s. It has compelling excitement, incredible comebacks, awe-inspiring moments, and all the heartbreak of college sports all in one. It will likely never be as popular as men’s basketball–that’s a conversation for another time–but this tournament deserves the opportunity for fans to appreciate the sport as much as possible. Right now, that opportunity doesn’t exist. It’s a disservice to college basketball fans, general sports fans, and the women who compete in this game. But this very simple fix would go a long way towards resolving one of the major issues of March Madness.